Stuttgart: Weitbrecht in Thienemanns, 1990. This is the German hardback edition of Talking God, the ninth book in Tony Hillerman's Navajo Mystery Series. This edition was published in Stuttgart by Weitbrecht in Thienemann in 1990. 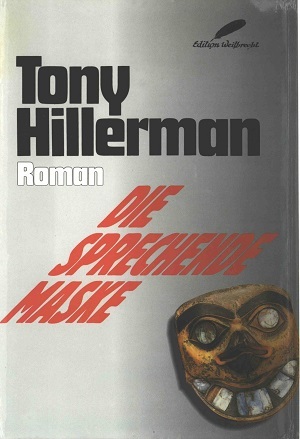 The text was translated from English into German by Peter Prange and the title translates to "The Talking Mask." The dust jacket was illustrated by Jurgen Reichert and features a picture of a Northwest Coast style mask. Format: Hardback, 22.3 x14.5 cm. Binding: Red boards with the author's name, title and publisher's device printed in black vertically on the spine.